The Tri-Lakes area offers everything from cozy, small-town living to sprawling properties with magnificent homes and scenic mountain views. There are certainly great foreclosure deals to be had here, with condos and townhomes listing under 100K, while many of the larger, foreclosed single family homes run in the 200's and up. The Tri-lakes area really does have something for everyone. Foreclosed condos, townhomes and small single family homes can be found in Monument, Palmer Lake and Wakonda Hills. Golf Course living is featured in neighborhoods like King's Deer, King's Deer Highlands, Woodmoor and Woodmoor Forest. Expansive lots among the pines are available in the Canterbury, Arrowwood, Bent Tree, Canterbury, Red Rock Ranch, The Timber and the Higby Estates neighborhoods. Great, affordable suburban homes are found in Promontory Pointe and Jackson Creek neighborhoods, while Walden Preserve is a very exlusive, gated community. There is always something to do in the Tri-Lakes area. Monument offers an appealing blend of galleries, home décor, book and specialty stores, as well as restaurants and professional service businesses within town and large, chain stores and restaurants just a few minutes away along with many festivals such as the Art Hop and music in the park. 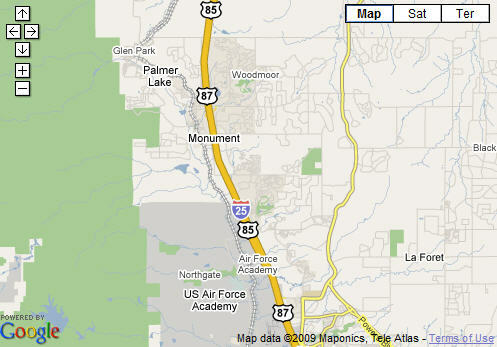 I-25 travels through the heart of the Tri-Lakes area providing easy access to Castle Rock and Denver to the north, as well as Baptist Rd and Jackson Creek Shopping Center, the Air Force Academy, Northgate shopping and entertainment as well as Downtown Colorado Springs to the south. The Tri-Lakes area also offers countless outdoor recreational opportunities. The three lakes that the area is named for also provide fishing, hiking and nature watching opportuities. Just to the north, the Monument Open Space Preserve provides miles of trails around the Monument Rock for horseback riding, jogging, walking your dog, and hiking; and serves as the Sante Fe Trailhead which is the northern part of the extensive Colorado Springs Trails Network. Lewis-Palmer School District 38 serves Monument. D-38 is a 'small town district with big time learning' whose schools are among the top in Colorado and are accredited with distinction from the state. Students here mostly attend Lewis Palmer High School. An amazing setting, great neighborhoods served by great schools, along with access to metropolitan amenities and outdoor recreation make finding a foreclosure deal in the Tri-Lakes area a great idea. Click here to search all Tri-Lakes homes for sale.